Giants fans have been blessed with great baseball the last few years. And, once again this year, baseball graced the duck hunting. 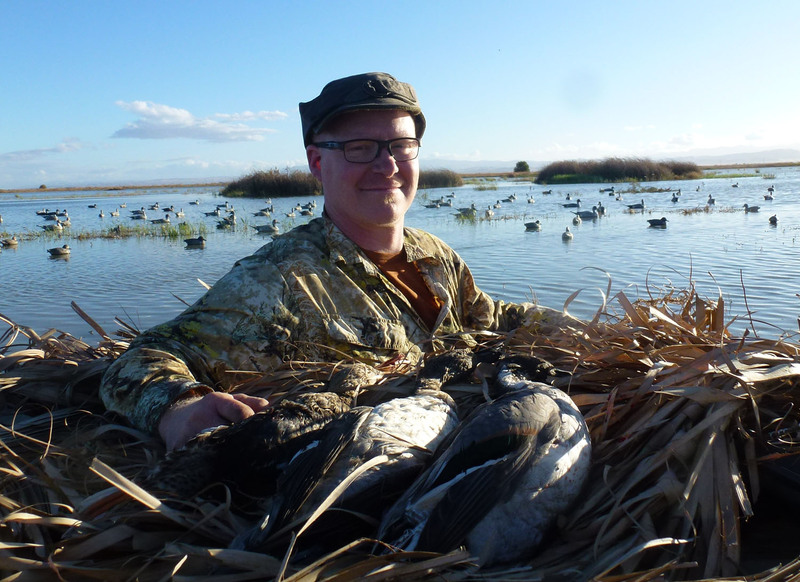 On Saturday my son-in-law Brett Kelly joined me for a duck hunt at the Kerry Club in the grasslands. Because he had to work late and also because it appeared that the weather might make a late day hunt work out, we left home late and had breakfast along the way. It was about 11 AM by the time we reached the blind. Most of the hunters had already killed their ducks and headed out, but three blinds were still active. The hunting was terrific. And, when the game started we tuned in for a great Giant victory. We came home with our sprig, a few teal and a couple spoonies. In addition we stopped for a steak dinner and watched most of the remainder of the game, which featured a great comeback victory. 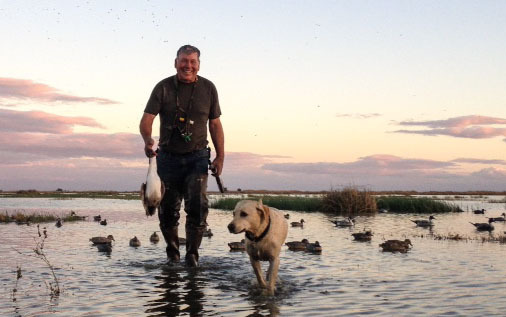 Brett snapped this photo of me and Lola on the way back from retrieving a sprig that sailed a ways in the wind. Nice photo taken with his I-Phone. Earlier I took a shot of Brett with some of his ducks. Brett is getting serious about duck hunting. Large flocks of pintail circled us all afternoon. The stiff wind made shooting a challenge, but we got our birds. Tomorrow will be the last day of baseball in 2014 and Giant fans have been blessed with maximum baseball. What good fortune. Win or lose tomorrow it has been a great ride. As a result of a September 27, 2012 post about the William Cashmore double barrel shotgun I purchased in 1972, I received a very helpful email about William Cashmore, the gun maker. I’ve decided to copy it here so as not to change any of the information provided by William Cashmore’s great, great granddaughter. This is a testament to the power of the internet. I was browsing on the web using the words “Cashmore guns” because I am researching our family tree and William Cashmore was my great great grandfather. I read your blog and it was so good to see the pictures. William, the gunmaker, (the son of William, a maltster and master brewer!) was born in 1819 in Birmingham, Warwickshire, and married Sarah Bland, daughter of Edwin Bland, gun finisher. Sarah’s brother Thomas Bland was also a gunmaker, and the two families/companies collaborated on several developments. There were also engravers in both the Cashmore and Bland families. In the 1851 census William and Sarah were recorded living in Newton Street, with 2 daughters, Julia & Elizabeth. In the 1861 census they lived in Steelhouse Lane, and had added 4 sons, William (b.1853), Thomas James (b.1857), Albert (b.1859) and Frank (b.1860). William described himself as a gun and pistol maker. The 1871 census records William living at Holte House, Aston Village, (now under the Aston Villa football ground) with Sarah, Julia, William, Thomas, Albert and Frank. On 9 December 1887 F (Frank ?) Cashmore and T Bland patented a rotating block striker mechanism for four barrelled guns (No. 16969). William died in 1877. The 1891 census records Sarah living as a widow at 261 Hoagley Road, Edgbaston, with Albert (a gun maker, my great grandfather) and Frank (aged 27 living on own means) and a grandson, Frank Edwards (b.1881). On 11 October 1894 S Mills patented a locking mechanism which used downward hinging external arms to operate internal locking lumps on either side of the action (No. 19300). This patent was used by William Cashmore who on 12 September 1895 patented an improvement to it (No. 17040). On 20 December 1895 William Cashmore patented a single selective trigger mechanism in which the trigger was in either a left or right position (No. 24426). On 7 March 1896 F Cashmore, C O Ellis and E W Wilkinson patented an extractor and ejection mechanism for revolvers (No. 5151). On 18 November 1896 W Cashmore and G Brazier patented a safety catch(No. 25944). On 9 December 1887 F (Frank ?) Cashmore and T Bland patented a rotating block striker mechanism for four barrelled guns (No. 16969). The company made some guns for Annie Oakley, one of which is I believe in the Cody Firearms Museum in Wyoming. Sorry if this is too much information! I live in England, in West Devon. Don’t worry, I won’t bombard you with any more of this stuff, but if you have any questions, please get in touch. Before posting her email, I checked in with Mary and she asked me to note that some of the information she provided is best guess and not verified. She also gleaned the information from sources like birth and marriage certificates, Ancestry.com and census documents.